Welcome to My Kitchen Serenity! 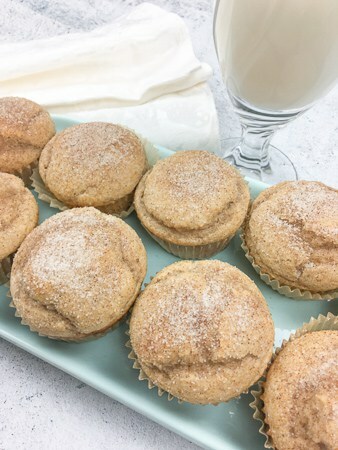 I’m excited to share with you our favorite cinnamon applesauce muffin recipe! 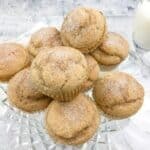 Cinnamon sugar has always been a favorite for my children. And I grew up on cinnamon sugar toast! 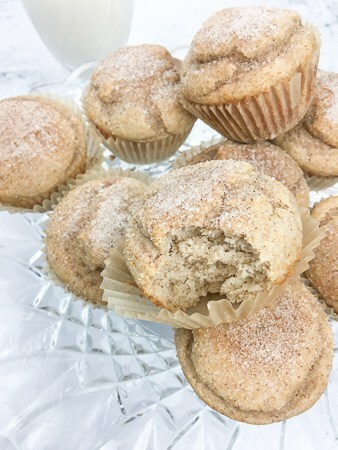 So, topping these muffins with cinnamon sugar was a no brainer. This recipe calls for Bisquick instead of flour, which gives the muffins’ texture the slightest hint of a biscuit. Oh, but they are still very much magnificent “muffins” my dear friends. 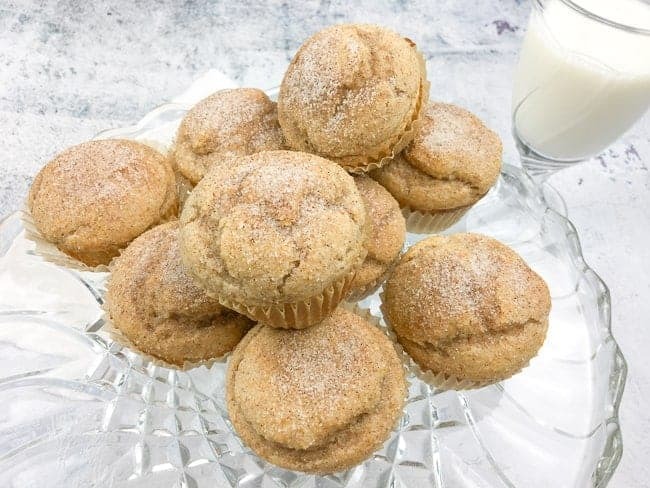 These muffins are moist and full of apple cinnamon flavor! Have them for dessert with your favorite coffee or tea. Mix sugar, cinnamon, applesauce, egg, milk, vanilla extract, and oil in a large bowl. Then add Bisquick and blend well with a whisk. Lightly grease muffin pan or use paper liners. OXO offers a wonderful, heavy gauge muffin pan with easy grip sides…find it here. Fill the muffin cups 2/3 full then bake at 400 for about 10-12 minutes or until a toothpick inserted comes out clean. After baking, brush tops of muffins with melted butter. Sprinkle tops with cinnamon sugar mixture. Enjoy! Makes 8-10 muffins. Preheat oven to 400. Lightly grease muffin pan or line with paper liners. Spray paper liners with non-stick spray to keep muffins from sticking to paper cups. Mix the cinnamon, sugar, applesauce, egg, milk, oil, and vanilla extract. Then add Biscuit (and nuts if using) and blend with a whisk. Fill muffin cups 2/3 full and bake for 10-11 minutes or until wooden toothpick inserted into muffin comes out clean. Remove muffins from oven and brush tops with melted butter. 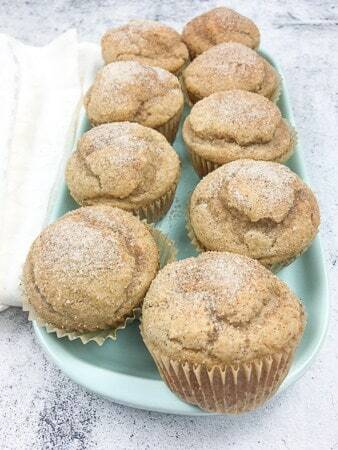 Mix the remaining sugar and cinnamon, and sprinkle on top of muffins. If you try these muffins and like them, please let me know by leaving me a comment. I’d love to hear from you.